Surprise! 2011 was a banner year. So far my husband and I have experienced infertility, adoption, and a miscarriage. When we lost our first baby in June 2011, we had no idea what God would do next. In August of 2011, we found out we were expecting again. I told my husband, “Go figure. 15 years and nothing. Then I get pregnant twice in less than six months.” 🙂 We went to the doctor and sure enough, I was pregnant. Our due date this time was April 28th. I was still 39, but by the time this baby would get here I would be 40 years old. 40 years old having my first baby. God sure has a sense of humor. I think the medical community calls this a geriatric pregnancy. Some call it crazy. This pregnancy went really well. I got past week 11 and that took a load off of my mind. Then I got past the first trimester and I started to breathe a little easier. They say your chances of miscarriage really decrease if you get past week 13. Right before Christmas we found out we were having a girl. More pink, more froo froo, and more hair bows! I was starting to look pregnant and not just like I had too many burgers the night before. In the middle of January, I got really sick. I had a bad case of the flu (we think) and was sick from Sunday evening until Wednesday. Thursday I felt well enough to paint Lydia’s bedroom, although I was having some sore muscle pain on my side. I called my best friend who suggested it might be from throwing up for 2 days. She also suggested if it got worse, to call my doctor. About 2pm I decided I needed a nap. When I woke up around 4, I was still having this weird pain. It wasn’t very strong, just annoying. And it wasn’t constant. It would happen about every 8-10 minutes and last about 10 seconds. Yes, I timed it. My doctor’s office closes at noon on Thursdays, so I called my sweet friend again and she suggested going to the ER if it continued to get worse. I told my husband about 6:00 pm that we should probably go to the ER and get this checked out. The worst thing they could say was that it was gas or something and send me home. He was not very excited about sitting in the ER for hours to find out it was gas, but he humored me. There is an advantage to being pregnant. When we got to the ER and they saw I was pregnant, they took me straight back to labor and delivery. No waiting room for me. Nope. Pregnant women about to enter their third trimester are special. 🙂 I didn’t even have to walk, they wheeled me back there in a wheelchair. They hooked me up to some machines and told us I was in labor. Ummmmm. Excuse me? I am only 26 weeks along. I can’t be in labor. Besides, don’t you watch TV and movies? Women in active labor are screaming and writhing in pain. I was not in labor. The nurses hooked me up to something like magnesium to slow down the labor and monitored me for a little while. Once they felt I was stable, they transported me to Tulsa. Bartlesville is not equipped for babies born earlier than 34 weeks, so I got to ride in the not-so-comfortable-and-not-so-fast ambulance 40 minutes south to Tulsa. At one point on our ride I asked the ambulance attendant guy when this magnesium stuff was supposed to kick in. He looked puzzled. “The contractions aren’t lessening?” “Nope.” Instead of lessening, the pain was getting stronger. He nervously answered, “We’ll be there in about 10 minutes.” During this time, my husband was following along behind us in the car. Unknown to me, he had already started calling people and asking them to pray for whatever was going to happen that evening. I was in the ambulance praying God would intervene so that by the time I got to Tulsa I could say, oops, false alarm. But, regardless, I had this unexplainable peace that everything was going to be okay. 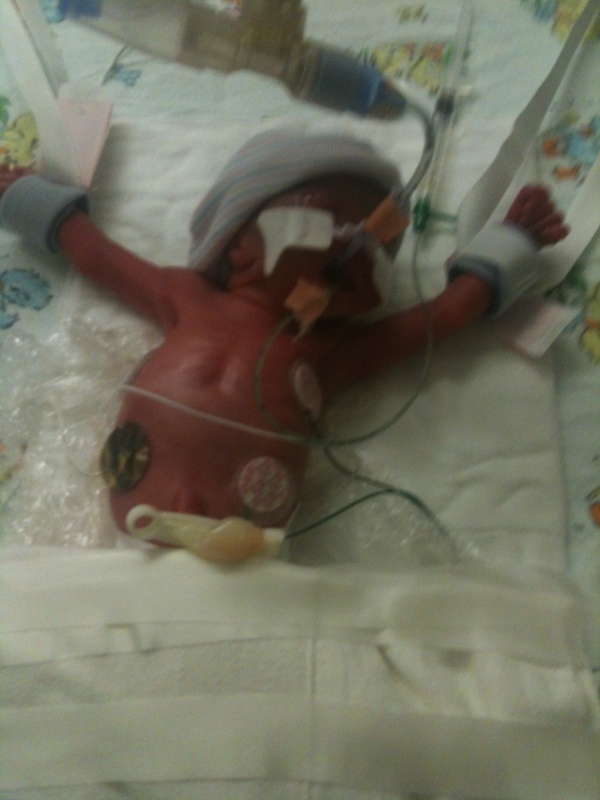 I had no idea what condition this baby would be in, or if she would even survive, but I knew God was in control. Again, nothing happens to us that God does not allow. I arrived at St. John in Tulsa at 9:00 pm. and was wheeled (this time on a stretcher) straight to labor and delivery. They checked all my vitals and told us we would have a baby sometime that evening. Ummmm. No, I was only 26 weeks along and we hadn’t agreed on her name!! Right after 9:30 the doctor I was sent to see said I had a couple of hours yet, so she went into a c-section. I would ask for an epidural, but the nurse would say she was waiting on my labs to come back. It wasn’t a problem, she said, I had plenty of time. Just before 10:00pm I told my husband something wasn’t right. The room at this point was empty so he went into the hallway for help. The nurse came in to check things out and then went back for reinforcements. In less than 1 minute my room was full of nurses and doctors. Our tiny little bundle was born at 10:01 pm weighing 1lb and 14 oz. and was 13 1/2 inches long. (and I never got my epidural. Do you hear the Wonder Woman music playing? HA!) She was small, skinny, purple, and looked like an alien, but she was one of the most beautiful things I had seen. Teeny, tiny baby. The nurse is holding the tube up so she can breathe. They were in the middle of intubating her. She couldn’t cry because her lungs weren’t fully developed. We quickly decided on a name (I won!) and little Emma LeeAnne was brought over to me. I didn’t get to hold her as the NICU doctor quickly brought her over, let me get a glimpse, then whisked her away to the NICU. A couple of hours later, Brian reminded me I was only 39. I had her before I was 40! Here she is. All purple, all covered in cords and cables and stickers and all beautiful. She still has a scar from one of her stickers holding a cord in place. It’s her tickle button. The first few weeks were touch and go. Emma would have a couple good days and then take a big step backward. I will never forget the day the nurse practitioner came in and gave us the worst-case scenarios. Pretty scary stuff. But we continued to place Emma in God’s hands, the best place she could be. It was very hard for me. I wanted to fix it. I wanted to do something to make everything better and ensure Emma would survive. But I couldn’t. I firmly believe God places us in situations that require us to rely on Him for our strength. I couldn’t do it on my own, but I knew Someone who could. I don’t like the phrase “God will never give you more than you can handle.” If we could handle it on our own, we wouldn’t need the Lord. I believe God gives us just enough to make us turn to Him and not rely on our own strength. 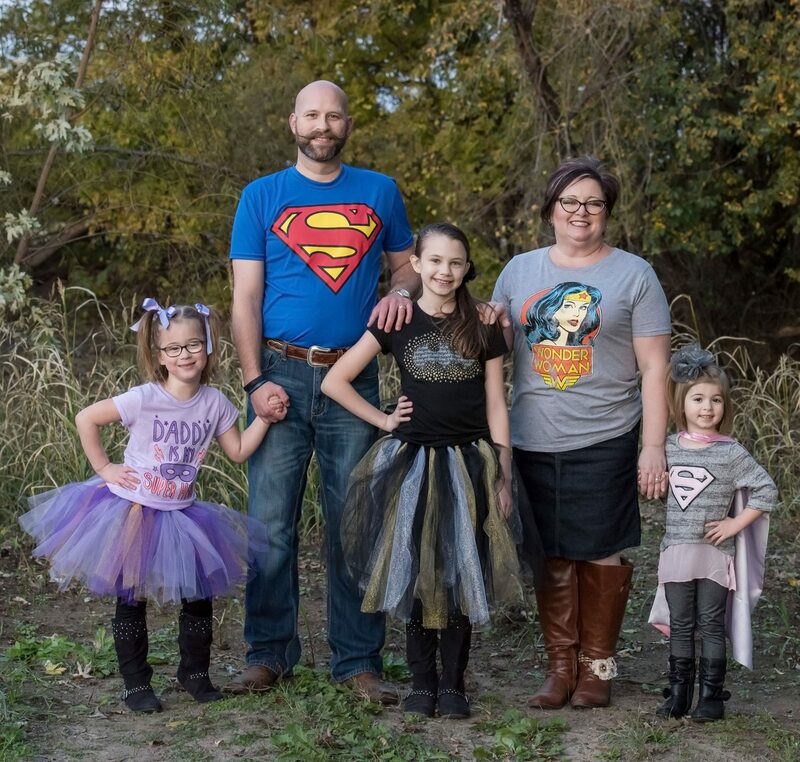 We spent 89 days in the NICU at St. John in Tulsa. I have to say we had the absolute best medical staff you could ask for. We absolutely loved our nurses and nurse practitioner. (We loved the doctors, too, but the nurses saw her and took care of her every day.) They took care of our sweet baby like she was their own. The first day I got to hold her was February 14th, almost a month after she was born. The day before our nurse found out I hadn’t held her yet. 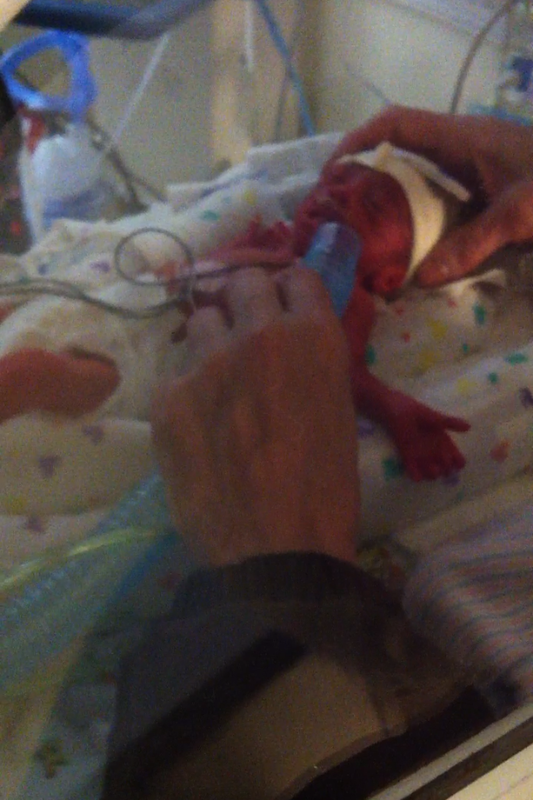 At this point Emma was intubated and she was so tiny, there was very little room for movement with her equipment. I received a phone call at home the morning of Valentine’s Day and was told Dr. Siddiqui wanted to arrange it so I could kangaroo with her. (Kangarooing is holding your baby skin on skin. It helps them feel the rhythm of momma’s heartbeat and many believe this is the first step to them really starting to grow and develop.) He told the nurses to tell me Happy Valentine’s Day. It was quite the task to get her moved out of her bed and into my arms, but I was told I could hold her as long as she would tolerate it. So we took advantage of it. I know we were there together for at least an hour. Those 89 days were an adventure. She had numerous brain scans, pic lines, and lumbar punctures (spinal taps). She developed pneumonia at one point, so she had scans for her lungs for a while. She had countless bradycardia episodes and some tachycardia episodes (those usually happened when she was mad at the nurses.) 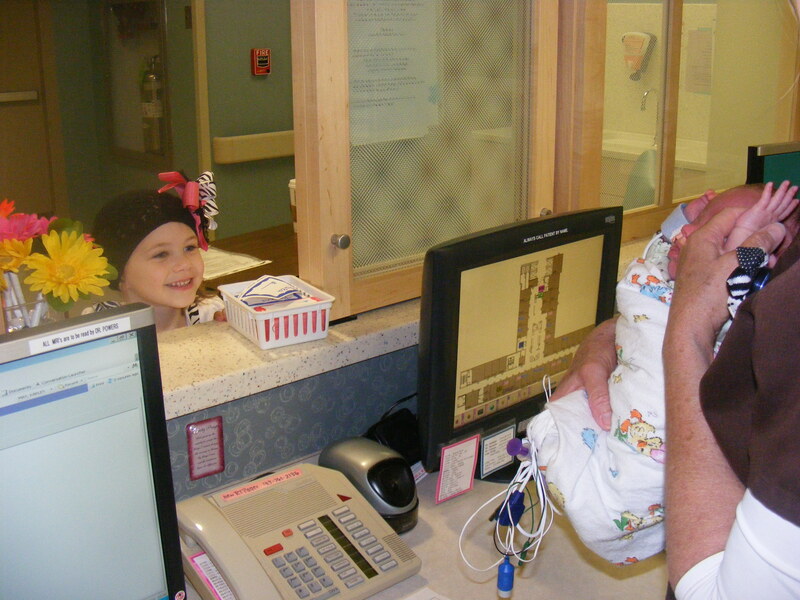 She developed retinopathy, so she had a pediatric ophthamologist come visit often. She had a grade 3 brain bleed, and up until the week before she was discharged, the neurologist wanted to put in a shunt. But God held Emma in His arms and protected her from any major permanent side effects. Lydia meeting Emma for the first time. Looking at her baby sister through the open nicu nurses window. We finally got to take her home April 17th. Lydia didn’t even get to meet her until the day before we brought her home. Emma was born in the middle of RSV season, so no one under the age of 18 was allowed in the NICU. Lydia only got to see her via facetime on our phones. 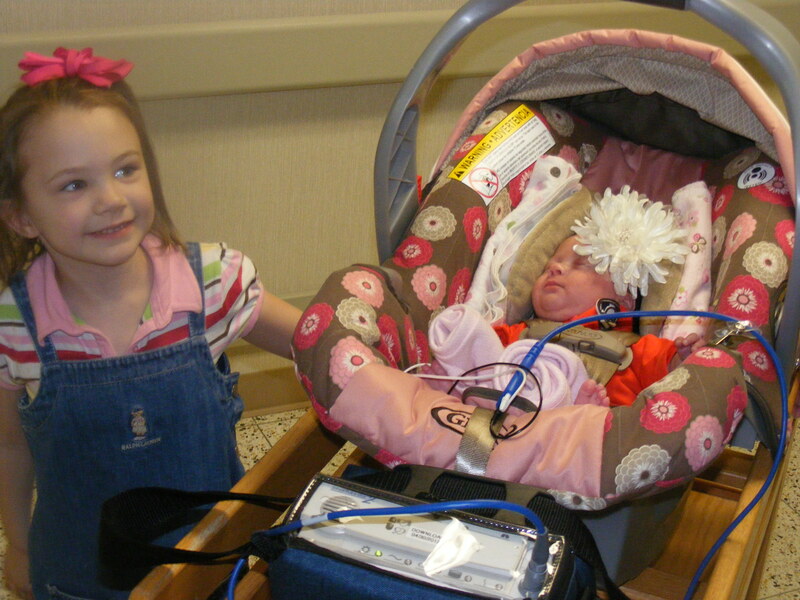 The first day she met her was through the nicu window. In her car seat ready to go home. Big bow on her head and heart monitor on her body. She was 3 months old and weighed 6 pounds the day we took her home. They never did install a shunt. She went home hooked up to a heart monitor and wore that until June. She is now a very happy, healthy, and funny two year old. She wears glasses due to a weak eye muscle and ankle braces because her ankles turn in slightly when she walks. Both situations we hope and pray are temporary. Emma playing in the church nursery. The smile on her face says it all. She is still a little behind in her speech, but I have no doubt that she will catch up. To us, she is a miracle. 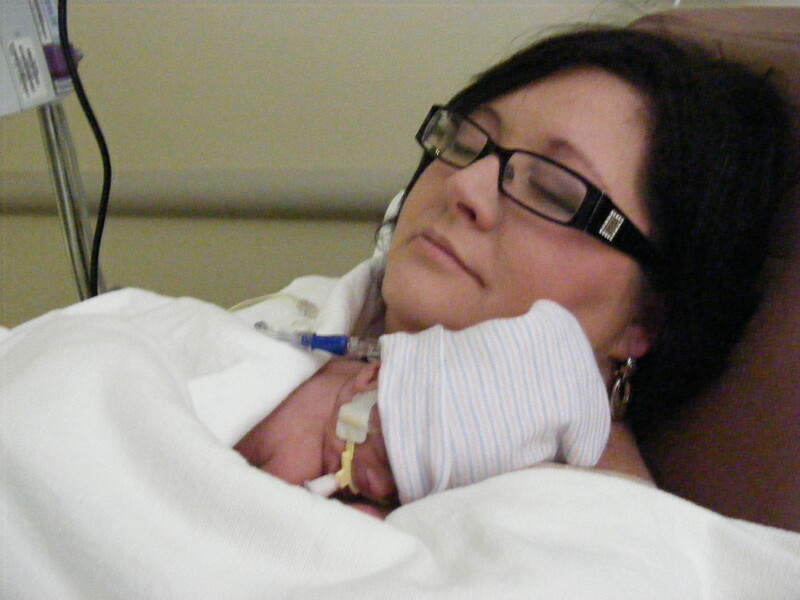 It has been said that preemies usually are caught up by the time they are two. Our physical therapist told us that they are rewriting the book on micropreemies, that they should be caught up by the age four. 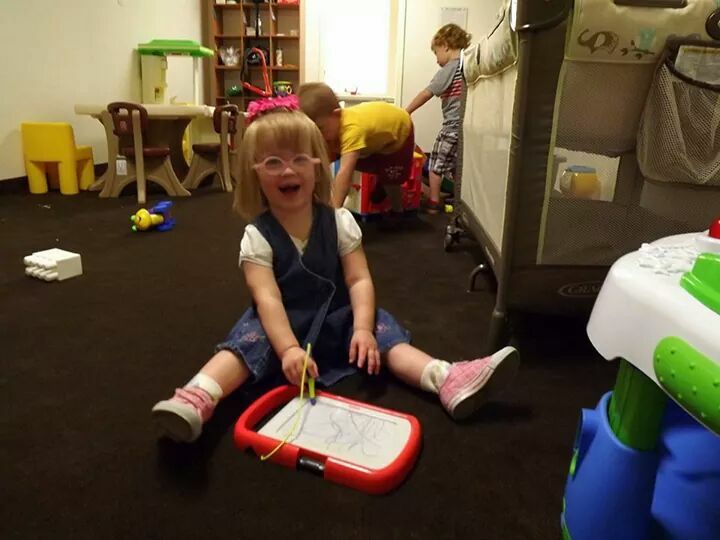 We have great physical and speech therapists working with her to ensure that happens. We may never know why God allowed this to happen. But believe me when I say Emma is worth every second of every minute. I can’t wait to tell her her story when she gets older. We even ordered a doll that is her exact birth weight and length so she can see just how tiny she was. I hope she realizes what an absolute miracle she is. And we are blessed to be her mommy and daddy. 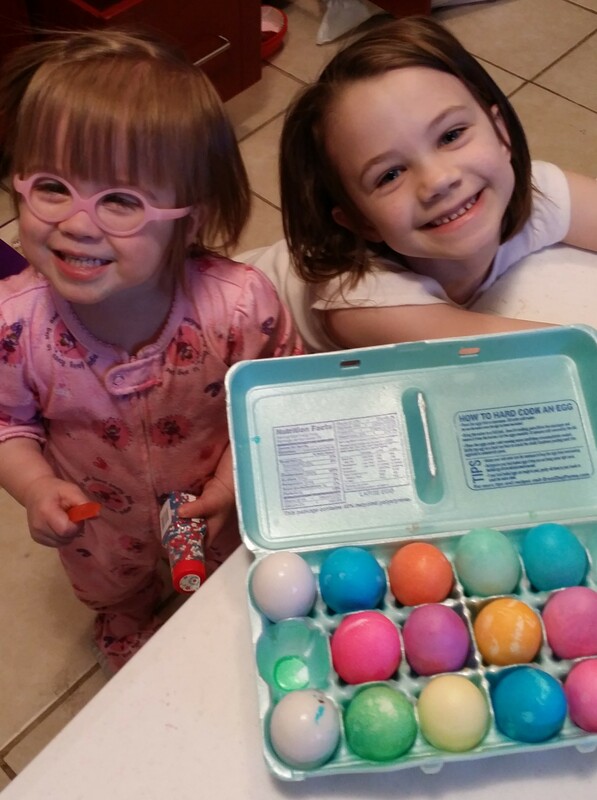 Lydia and Emma coloring Easter Eggs.